Here's another **FREE** app from iTunes! We believe that apps are the perfect tool to help ALL children develop their learning abilities, and at the same time they provide a positive impact on the child’s academic and social skills. Soundmatch was created with that concept in mind, to deliver the very best educational app that will benefit ALL children. The objective of the game is for the child to learn and distinguish sounds from the world around them. Just like a traditional memory game, Soundmatch has three difficulties that will challenge your child’s memory skills, as he will need to match an image with its correspondant sound and vice versa. 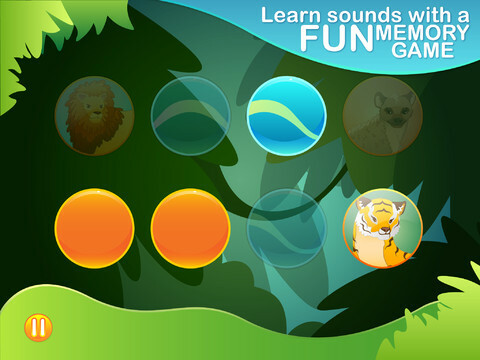 • Start by learning all the sounds on the main menu, you can select from five different worlds. • There are three levels of difficulty – easy, intermediate and hard. The first level offers visual aid – the game shows both the image and sound; the intermediate level shows only one card with image and other one only sound and the hardest level only includes sounds - Each level has 6, 8 or 10 cards to play with. • You can select from five different themes and track your progress for each session. • Practice your memory skills. Want to hone your skills? Try the training session to be a memory game master. • Track your child’s progress. You’ll have the ability to track the number of attempts to complete a specific exercise. • Difficulty selection. Want a challenge for your child? Select from three levels of difficulty to hone your child’s memory skills. • Theme selection. Soundmatch includes five different themes to hone your child’s memory – wild animals, nature, home, music and vehicles. • English and Spanish supported. Change the game’s language at any time. • Tutorials. User-friendly instructions that show the child how to play the game. Visit us at EdNinja.com for more information."